Where born: Bodmin, Cornwall, U.K.
Commemorated: Groesbeek Canadian War Cemetery, Gelderland, Holland; Victoria Park Cenotaph, Woodstock, Ontario, Canada as well as a plaque at Woodstock Collegiate Institute. Kenneth George Truin, born December 18, 1920, son of George and Lillian Truin, immigrated to Canada, in 1924. He attended school in West Zorra and Woodstock. 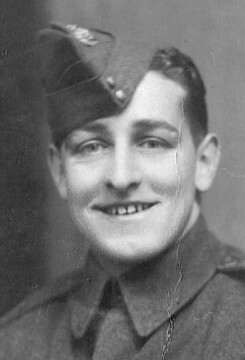 Kenneth was a Sapper with the Royal Canadian Engineers. He was very active in horseshoe pitching and toured around Britain setting up horseshoe tournaments for Canadian Servicemen.He was fatally shot by a German Sniper on March 15, 1945, after blowing up an enemy bridge. He had volunteered for this action, as he was the only single man in his unit.Kenneth was buried in the Groesbeek Canadian War Cemetery in Holland.